If you are a regular reader of this blog, you might assume I do nothing in the winter other than ski and work. Not so! There is so much to do in the Adirondacks, I sometimes get overwhelmed trying to keep track of all the opportunities to have fun. Here are just a few examples: NCAA ice hockey tournaments and Celtic rock concerts. This weekend, Lake Placid will host the 2009 NCAA® Division III Men's Ice Hockey Championship at the Olympic Center on Main Street. According to ORDA, "The weekend features a full array of tournament-related activities and offerings from Lake Placid’s Olympic venues. One of the elements that makes this championship unique from other sites is the fact that spectators and fans will be able to experience bobsledding, skiing or riding, ice skating, tobogganing and more while waiting for the puck to drop in the evening." Yes it is unique. 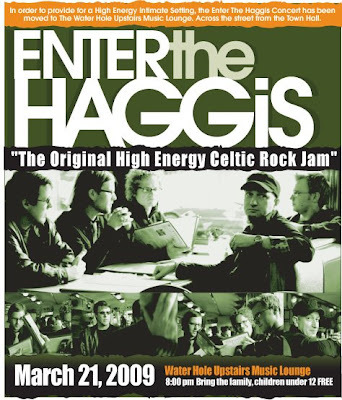 A highlight of the coming weekend for me is enjoying the music of Enter The Haggis, who make their appearance at The Waterhole, in Saranac Lake this Saturday evening. There is nothing like live music, especially Celtic Rock. Despite the fact that there is plenty of skiing yet to be undertaken, and certainly plenty of work to get done, there are clearly a multitude of other Adirondack distractions available.